Another cat person? This just won't float. Uh-oh, that ever sense of doom just grew ten fold. Sorry for the double post, but BEHOLD THE GREAT BATTLE! But the author killed a beloved character in his webcomic. The masses will riot and despise the comic even more. Ah, but don't worry, you can't destroy the power of Grumpy. ^_~ Remember, that frog ate him once and he came out okay. Beyond that, how could a fat hasmter eat himself and still burp? There's more to this battle than meets the eye! Oh snap, Linkara I see much retaliation headed your way! 2 Am not that fond of de fat hampster. Damn! I thought I had killed the jam. Spunky revived it with the presence of an attractive catgirl. The Neko wrote: Damn! I thought I had killed the jam. it's okay.. you tried... it's the thought that counts. Linkara wrote: Spunky revived it with the presence of an attractive catgirl. Or y'know, don't. Whatever. I have no time to cause any more damage. Working on a couple more pages. 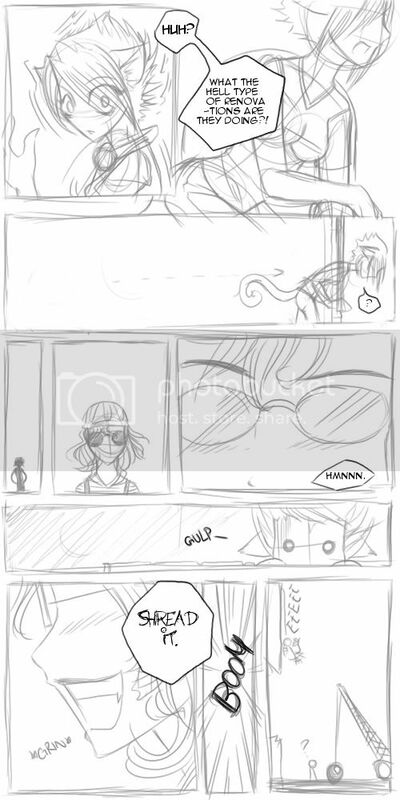 SpunkyNeko wrote: Working on a couple more pages. Why the hatred for this jam? Um, what the heck just happened? I think your wrecking ball forced Spunky to fall from the window. 834n wrote: I think your wrecking ball forced Spunky to fall from the window. Ah. I wasn't sure who the people in the last three panels were. Yeah, I'm a little confused as to what happened in that one.